Do you need to add hardware from multiple different manufacturers, and access those devices and settings from anywhere in the world? TagMatiks Core can do that. Do you need to track the movements of your assets and their locations, and have real time visibility of where they are? TagMatiks Core can do all of this and more. TagMatiks Core software easily integrates with any existing RFID technology because it has support for multiple reader providers including Impinj, Zebra, ThingMagic, and Alien along with any reader that supports LLRP. TagMatiks Core also supports Gen2v2 RFID tags. No matter where all of your devices are in the world, you can manage all of them from the TagMatiks Core Reader Manager and Printer Manager on the cloud. You’ll also have access to every device’s settings, and can change them anywhere, anytime. Setup only takes a few minutes! Once the device is connected to the network, simply enter the devices IP address into TagMatiks Core and your device is connected. You can even install and connect this entire system in less than a day! This means that you can access this application from anywhere you have internet access. You do not have to manage this software in house, which is going to save you a lot of money, and allow your solution to grow with you. Each reader, when added to TagMatiks Core, will pull all the data about that reader out to show you in our software. These details include the reader ID, firmware version, model name, the RF settings of reader mode, search mode, and session, along with many more. These are pulled straight from the reader so you know they are accurate and will give you the information you need about your reader when you need it. Not only can you see all of those settings for each of your readers, you can also change many of the settings to fit your own needs. For example, you can change which antennas are enabled, the power levels of each antenna, and the RSSI cutoff value for each antenna. You can also set up a duplicate elimination time for each individual reader to provide aggregation to the data, as well as filter the tag reads with an EPC mask. Using the Read Zone Manager, you can map different devices and antennas together to make a read zone that fits your business needs. For example, you can add all of the devices connected to receiving door portals into one read zone, name it Receiving, and collect all the receiving data together. With TagMatiks Core’s Direction feature, you can easily tell which way your items are moving, by simply configuring the direction settings in the read zone. This will add the direction data to each tag. By adding an IN or OUT designation to each tag, this will organize your data even further. You can create physical read zones that contain all the devices in a specific location, and add a location name to that read zone. This will add that location data to each tag that was read in that location so you can easily track exactly where each item has been, and where each item is now. 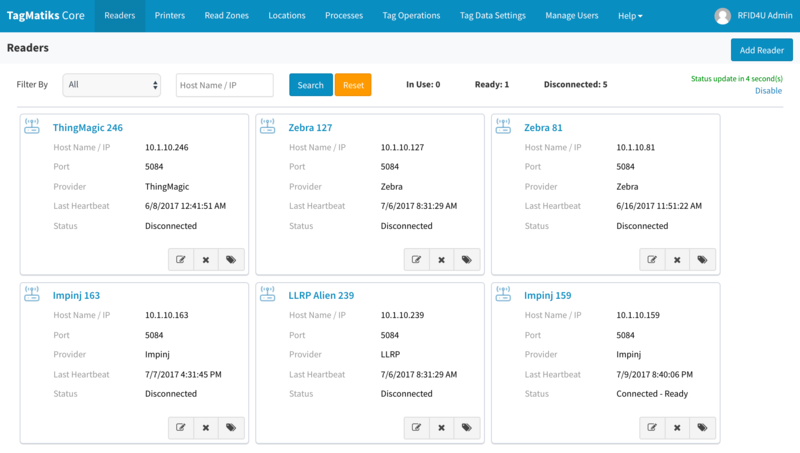 With the TagMatiks Core Process Manager, once you configure your endpoint, there is nothing left for you to do. Simply set it and forget it, the data will continuously be exported. You can even export the same data through multiple different endpoints at the same time! Processes also support the decoding of multiple tag data standards, including SGTIN-96, SGTIN-198, GRAI-96, and GIAI-96 and will decode any applicable tags before sending the data to the configured endpoint, so you do not need any software in between to convert that data for you. Endpoints currently supported are multiple different databases and API’s, SalesForce, and flat files. Full details on endpoint support can be found in the TagMatiks Core White Paper, and don’t worry, if you don’t see your endpoint listed, we can easily integrate with most systems. Each read zone has the capability to have completely customizable feedback based on the number of GPIO ports available on the devices in that readzone. Do you want a motion sensor on one device to trigger the start read, while another devices electric eye triggers the stop? Simply select this in the GPI Settings, and click save; you have total control! We have integrated the basic tag operations capability into TagMatiks Core middleware solution to be a complete solution. Here you can read from either a single device or read zone to test the reads, or to perform the Write, Lock, or Kill operations on a tag. With Administrator permissions, you can control what all the other users are able to access. You can also add, edit, and delete users easily, right from the TagMatiks application. TagMatiks Core is our RFID middleware solution, so it is imperative to be able to access all reader management functionalities available. You can also manage your printers and print tags through the API’s available. Anything that you can do with a mouse through the TagMatiks Core web portal, you can do with the API’s. See even more quickly how many readers you have that are in use, ready, or disconnected with those added statistics on the top of the reader details page for you. There is also the Last Heartbeat feature being added so that you can see the last date and time that each reader was connected to TagMatiks Core. TagMatiks Core is our middleware software that collects RFID tag data. It can be used as a standalone application that sends the collected data to a specified endpoint, or it can be used as a part of our modular system where it will send the RFID tag data to one of our Enterprise Applications. In fact, TagMatiks Core is necessary if the system utilizes RFID fixed readers and/or RFID printers. Every day, hospitals deal with massive amounts of tools, equipment and supplies, which have to be properly inventoried, allocated, cleaned, maintained, serviced, used, returned and discarded. By using our TagMatiks Core middleware solution to integrate your fixed RFID readers, and our TagMatiks FI solution to manage all of your handheld RFID readers and industry specific content, you will see many advantages. For example, some major benefits include seeing the complete status information of each asset, increased efficiency and accuracy through multiple-stage auditing processes, significantly reduce human effort and corresponding errors, scan multiple tags concurrently and automatically, and you will see a complete visibility of the assets within the supply chain, among many more. There are several areas in manufacturing that can benefit from deployment of an automatic identification technology, including access control, employee safety and mustering, inventory control for parts, materials and final product, shipping and receiving, tracking defects and points of failure, tracking time spent on a product, quality tracking, and much more. There are many benefits to integrating RFID technology, along with TagMatiks Core, into your manufacturing system, including the reduction of lead times and work in process inventory, an increase in efficiency of Just in Time delivery, more efficient and paperless processes with automatic tracking, automatic machine and process triggering based on item information from a RFID tag, and item level tracking with RFID which allows for product pedigree, work in progress status, inventory, rework, time spent, defects and failures tracking. RFID4U’s Asset Tracking System provides cradle-to-grave asset tracking and management which provides a complete audit trail of all assets throughout their complete lifecycle. By utilizing TagMatiks Core to connect and configure your RFID devices, and TagMatiks AT to manage all the categories and details for your assets, you will be able to identify objects faster, more accurately and at reduced overall cost at various points during the lifecycle of an asset, significantly reduce human effort and corresponding errors by automating your system, provide timely and accurate information to support management decisions, add security by recording asset movement and creating alarms and notifications when the asset is moved from a controlled location, and scan multiple asset tags concurrently and automatically. RFID technology has been used to authenticate products such as pharmaceuticals for over a decade, and with the invention of smaller and smaller tags, RFID has also penetrated the electronics and consumer goods manufacturing industries. Using our TagMatiks CF solution with TagMatiks Core, you will see many benefits including unique identification of your products for authentication, information about each product including the expiration date and manufacturing date, the supply chain information from manufacturing to the store, information on lot recalls, warranty tracking and service, and inventory management. Our out of the box solution allows to you create processes that can export data to multiple endpoints listed below, though we will work with you to add another type of endpoint for your solution if you require it. With a click of your mouse, your data can be quickly and easily exported to either a text file or a CSV file from multiple locations in the TagMatiks Core application. TagMatiks Core supports exporting data in both JSON and XML formats, with many levels of security, including basic and token authentication to keep your data safe. No matter what type of database you currently use, TagMatiks Core can export your data into it. Currently supported databases include MySQL, SQL Server, Oracle, and Postgres, either through a stored procedure or directly inserted into a table. There are many reasons why you would want to use TagMatiks Core, but the simple answer is this: TagMatiks Core provides a reader management system and a RFID middleware system in one, and this gives you the ability to simply ‘plug and play’ RFID. Though we recommend having us host TagMatiks Core for you on the cloud, it can be hosted on premise, or as hybrid cloud configuration as well. Our out of the box solution provides support for the top tier of RFID reader manufacturers, including Zebra, Impinj, ThingMagic and Alien. TagMatiks Core also supports any reader that supports LLRP (Low Level Reader Protocol). Currently, TagMatiks Core only supports Zebra Printers, but we will work with you to integrate printers from other manufacturers if necessary. A basic read command will return to you the EPC, the name of the device that it was read from along with that device’s hostname or IP address, the antenna port number that read the tag, the read time and date, and the RSSI value. There are more possible configurations where the read zone and process names will be added, as well as the location name and/or the direction of the tag. The end user will configure the aggregation and filtering settings that they wish applied to the tag read data by setting a duplicate elimination time and a filter mask. The filter mask applies to the EPC memory bank of the tag. The duplicate elimination time is the specified time period where if the same tag is read within that specified span of time, it is considered a duplicate and it will be ignored. With at least one major release every year, you will always be up to date with the latest features and benefits that are continuously being built into TagMatiks Core. Below are some of the upcoming features that will be added to TagMatiks Core. Soon you won’t have to worry about finding each reader’s IP address or hostname in order to connect it to TagMatiks Core. With our new auto discovery feature, you will be able to automatically scan your network to find all available readers with just the click of a button. Now, not only will MySQL, SQL Server, Oracle and Postgres be a part of our standard options for integration, but so will various NoSQL databases. Our team is working now to get this integrated as a standard feature.